If you weren't yet aware through your connections at the Swiss bank, the Aston Martin Vanquish S will be offered with a six speed manual. That to satisfy enthusiast bankers who spend the weekend using all 12 cylinders to dodge the trams in Zurich. 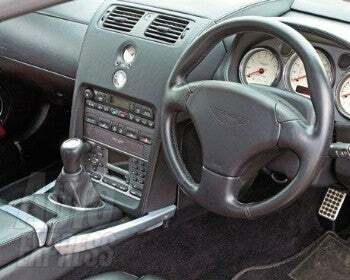 But the option can also be retrofitted on Vanquish models all the way back to 2001. But it's not exactly a blue-light special. In the UK, the six-speed manual is a 15,568 option. Don't even bother doing the conversion unless you have enough gold reserves to cover it. Aston Martin&apos;s Bon Voyage Vanquish S "Ultimate Edition"